Living Charlotte Mason in California: Teaching Reading . I confess, I don't teach reading the CM way. 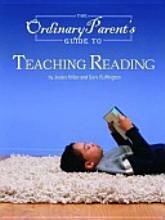 When we were first getting started with homeschooling, a friend recommended the book The Ordinary Parent's Guide to Teaching Reading to me. I bought it without having a clue as to how to teach reading and used it with my oldest daughter and now with my 7yo son. It has all the lessons in there to get you through; starting with the sounds of the vowels, consonants, short words that can be sounded out phonetically, then moving into consonant blends, digraphs, vowel combinations, etc. through all the lessons to learn reading. My just-turned-9yo daughter in YR3 did well with it and is reading well now. She's read Little House on the Prairie by herself, but she's not quite at the point of being able to read her school books. I think they're intimidating to her, and understandably so, we read incredibly well written books. Just today, in Chapter XVI of This Country of Ours, which I asked her to read, she came across: seafaring, loathsome, thereof, Stygian, and Counterblaste - on the first page alone. Now, if I had been doing this 'correctly', I would have skimmed the chapter, written the difficult words on the board, pointed them out to her and defined them for her so that they wouldn't hinder her in her readings. And even as I'm writing this, I'm realizing this is extra step, which might take me 10 minutes, is really going to be worth the effort to get her over the hump to reading her own books. Mom, my tie will choke my neck and make me cry. Why must I keep this tie on? It is just lunch with Dad and Sis. I will be shy in a tie. What I like about it is that it goes through all the 'rules' like, 'y' at the end of a word says the long-I sound as in my, by, why, etc. and they provide bits of reading containing the words using those rules that they need to learn so they get the practice they need to learn it. What I don't like is the dullness of the reading itself, so to compensate I've been having him read from the McGuffy and Elson readers as well as Frog and Toad, Little Bear, Mouse Soup, Owl at Home, Grizzwold and others. Another thing that bothers me is how many exceptions there are to the rules. For example, no sooner do we have a lesson on the vowel combination 'ea' making the long-E sound like in read, stream and please than we run into the words heart, dead and ahead. Phonics alone just won't get you very far in the English language and so I think there's great truth in teaching children to read the 'CM way', or what I understand to be the CM way. It just seems a daunting task for me to have to craft daily lessons from scratch. And truth be told, I do find some comfort in learning the rules also - because it gives them some direction when they run into a word they're not sure about. With 2 more little ones up and coming who I will need to teach to read, I am interested to know what's working for others. I had a friend who taught her daughters to read just by sitting down with them and having them read daily from a Berenstein Bears book. Every time they got through a whole book, she would take them to buy a new one. They were reading The Hobbit by the time they were 7 years old! Another aspect of teaching reading that has been a challenge at times is the fact that I have delayed teaching reading much later than the public and private schooled children who my kids sit with at church. Reading is such the measure and bar for achievement at this age and it takes great confidence in what I'm doing and my philosophy of education not to get deterred by that. Thankfully, my kids aren't bothered by it because we've talked about it and I've let them know that we just think it's better for them to take their time to learn to read, and in the meantime, they're not missing out because I read a ton to them. It is my intention to get them to read on their own as quickly as possible because the benefits of seeing the words and sentence structure, etc. is so beneficial to spelling and other aspects of their learning, I just don't want it to be at the expense of their desire to read and to know what they read. While my son dislikes the Ordinary Teacher's Guide reading lessons, he asks to read his Bible to us, and even though others are reading so much better than him, he still asks to read it in his church class - at a painfully slow rate in comparison. I hate to admit that I feel myself getting embarrassed for him, particularly when the boy next to him continually corrects him, but he himself is very positive about his own progress and ability so that's what I keep in the forefront. When others note that's he's slow reading, rather than get into a big discussion on better later than sooner and the importance of preserving the child's love and desire of learning, etc., I just brush it over and remind myself that this is the path I've chosen, and very thoughtfully at that. And when the reading, and beyond that the writing, catches up, all the other things that matter to us will show themselves true - attentiveness, the desire to learn, thoughtfulness about what is read, understanding, etc. Hearing about how boys, and consequently men, are falling adrift because they are being pushed too fast, too soon, academically also reminds me that it's the big picture that I need to keep focused on and reassures me that I'm doing the right thing for my kids. Sometimes it takes a lot of faith to educate your child differently! That's why it's such a blessing to be able to connect with and support one another along this journey. I am grateful for you!! Thanks for sharing Naomi! I too have to remind myself to have faith in my teaching method (especially since I use to be the one teaching in the public schools!) I have used The 100 Easy Lessons to Reading and found them to be boring but do the trick. We are not yet through it and I even took a break from it for 2 months because I didn't see too much progress but now that we are back at it she is picking it up much more easily! We recently starting doing what I call a "morning message" which they have loved! The night before I write them a note. It could be about the days schedule, a review of something, sharing new exciting news, anything. The next morning we read it together (myself and my 6 and 3yr old). After I read it I ask if someone else would now like to try. After my 6 year old reads it then I call on them individually to do something that is at their "level". I might say "Could you find a word in line three that rhymes with happy?" or to my 3 year old, "Can you find the letter S and circle it?". There are so many possibilities (rhyming words, letter sounds, counting sentences, finding nouns...)and almost any age can be involved! I also found comfort in phonics when I read somewhere that the rules only account for about 80% of words and the other 20% you just have to learn by sight. It made me less frustrated somehow with all those words that just won't follow the rules :) ! Thank you for this! This was encouraging to me...I am using Teach Your Child to Read in 100 Easy Lessons right now and my dd is getting it but I've wondered what else is out there. I've also wondered about the CM way. I'm not sure how my 2nd oldest, a son, will do with the method I'm using now. Katie - I love the morning message, what a great idea! I'm not familiar with it at all, but would be interested to hear what others think of it if anyone uses it. I've not "met" another soul that uses the Elson readers! We love them, and use them through grade six. The jump to HEO was just too much to ask my daughter to keep an Elson on board. If I hadn't just taught my last one to read, I would by snatching that new guide up from SCM! Thank you, Naomi! I will check it out! Thank you for the link to your post and all the links in there also. I bookmarked it and plan on going back there when the time comes for number 3 to learn. Legal Disclaimer: LivingCMinCA is a participant in the Amazon Services LLC Associates Program, an affiliate advertising program designed to provide a means for sites to earn advertising fees by advertising and linking to amazon.com.